Iowa Congressman Steve King says he hopes the trade disputes between the U.S. and other countries can be resolved sooner rather than later — but he is not optimistic. King says he has said he’d like to see the trade issues solved before the soybeans turn ready for harvest, but he says in talking with the top two White House negotiators, he is not as optimistic as he was. King, a Republican, says they don’t even had a NAFTA agree done yet. King says Canada seems to be holding up that agreement, while Mexico is ready. 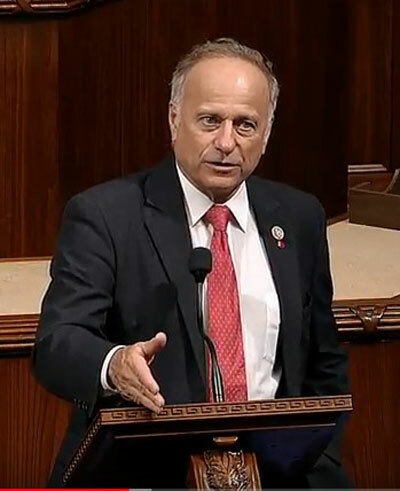 “So, the president has indicated he may be ready to cut a bilateral trade agreement with the Mexicans, and then to a bilateral negotiation with the Canadians, hoping to get that resolved,” according to King. King says trade with China poses a whole different series of problems, particularly for the Fourth District he represents — as the district is top in the state in pork and soybean production. “Don’t forget that the center of the objection with China is not the trade imbalance — but instead is their theft of our intellectual property. The lowest annual cost of the thievery of our intellectual property is $250 billion dollars a year. The highest number I see is $600 billion a year,” King says. He says the recent administration decision to make up producer losses will help for now, but he wants the trade battle to end as quickly as possible.